ROME (AP) — Paulo Dybala came off the bench to lift a sagging Juventus to a 1-0 win at Bologna on Sunday and help the seven-time Serie A champion rebound from a deflating loss in the Champions League. 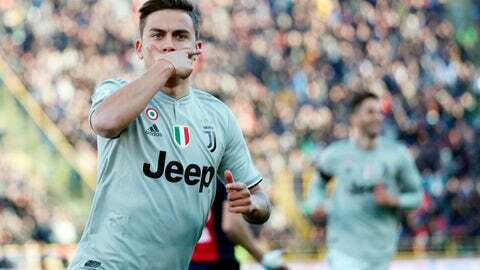 Less than 10 minutes after he came on in the second half, Dybala seized upon a deflected cross from Blaise Matuidi and pounded a shot into the far corner for his second goal in two Serie A matches. Juventus had faced nine shots in the first half, matching its worst mark this season in all competitions, and Cristiano Ronaldo had another quiet performance just like in the 2-0 defeat to Atletico Madrid on Wednesday. In stoppage time, Juventus goalkeeper Mattia Perin preserved the advantage by tipping a shot from Nicola Sansone off the post. Still, Juventus became the first team in Serie A history to win 22 of its opening 25 matches — having drawn the other three in what could very well turn out to be an undefeated season. Juventus remained 13 points ahead of second-placed Napoli, which won 4-0 at Parma. Arkadiusz Milik scored a brace and Piotr Zielinski got the opener as Poland internationals accounted for three of the four goals in Napoli’s comfortable win. Adam Ounas also was on target. All four goals included touches of brilliance. Elseid Hysaj used the side of his foot to brush in the cross for Zielinski’s opener. Milik rolled in a free kick under Parma’s wall and then calmly picked his target from the edge of the area for his second. Finally, Ounas traded passes with Simone Verdi before concluding a counterattack with an angled shot. The lopsided score was welcome for Napoli after drawing three of its previous four matches. Video reviews had a big impact on third-placed Inter Milan’s 3-3 draw at Fiorentina. There was a long delay to consult VAR before Fiorentina was awarded a penalty 11 minutes into stoppage time that was converted by Jordan Veretout for the equalizer. Inter defender Danilo D’Ambrosio was judged to have handled the ball after intercepting a cross from Federico Chiesa, even though replays showed that the ball hit his chest before his arm. In a wild match from start to finish, Stefan de Vrij scored an own-goal to put Fiorentina ahead less than 20 seconds in. Matias Vecino and Matteo Politano then put Inter ahead before the break. Fiorentina had a goal from Cristiano Biraghi disallowed on review for a foul but then Luis Muriel scored for the hosts with a curling free kick. Inter’s advantage over fourth-placed AC Milan is now just two points. Fabio Quagliarella converted a second-half penalty as Sampdoria beat Cagliari 1-0 to stay within striking distance of the Europa League places. Also, Sassuolo and Spal played to a 1-1 draw with Andrea Petagna’s penalty for Spal canceling out Federico Peluso’s opener. Chievo Verona and Genoa ended 0-0.